We refuse, under all circumstances, to copy or alter copyrighted text or images that do not belong to you. If you receive permission to use copyrighted items from the original authors/artists, we will need a copy of that permission for our files. Please keep your web site content GP rated. will be accepted. Your contract/account will be cancel with no refund being issued. Atomic Web Katz makes no endorssement, claims, or promises regarding the services offered by our clients and will not be held liable for any disputes or claims against said clients. In no event shall Atomic Web Katz be liable for any direct, indirect, incidental, consequential, special and exemplary damages, or any damages whatsoever, arising from the use or performance of this web site or a from any information, services or products provided through this web site. 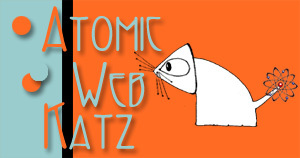 Atomic Web Katz takes extreme steps to maintain system integrity. However, Atomic Web Katz shall not be held responsible for loss of data due to any cause. To ensure the highest level of data protection, we recommend that all information be backed-up on your own computer.